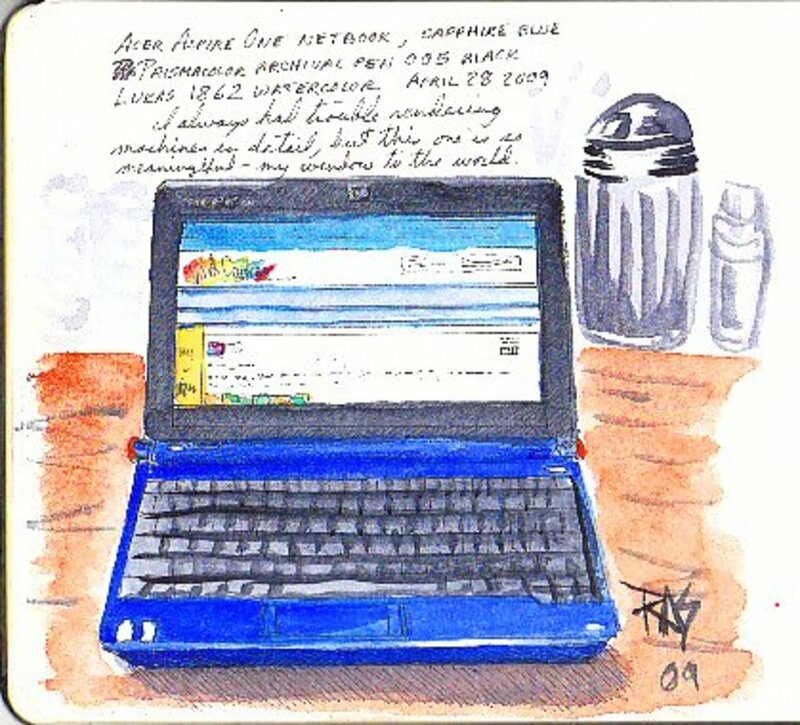 Acer Aspire One by Robert A. Sloan. Ink and watercolor in 5" x 8 1/2" Moleskine watercolor journal. #11 for 30 in 30 days that started on July 25th. I'm behind by ten Hubs but still might catch up. Back in the day, novelists used typewriters. Sometimes they were portable and sleek, the one I had in high school was pale blue, lightweight and genuinely portable. The result of course was that writing a novel meant stacks on stacks of physical paper in filing cabinets or just forming drifts around the room, sometimes highlighted and/or stuck into research books. The amount of information that could be handled that way... was easier to handle by remembering it and just writing the story. I'd keep the reference books handy in a stack and then go looking for jotted notes in order to remember which book had what I needed. If I was making it all up, setting the novel in a completely different world, I still needed to worry about continuity. Tons of notebooks with hand jotted notes in cursive writing were all over the place. If I was tired when I wrote the note, forget ever being able to understand what I'd jotted. This can get to be a huge mess. Then I got my first computer. Cut, Copy and Paste became essentials. No more physical stacks of manuscript pages getting tossed off the desk by a cat, only to be creatively refiled mixing the manuscripts of more than one novel. No more trying to find places to put boxes of paper when moving into a new apartment. At one time I had three or four empty printer paper boxes -- the kind that hold 20 reams -- plus a 4 drawer file cabinet and a two drawer file cabinet. Oww. My novels needed their own bedroom and were whining about needing bedrooms of their own if I'd get off my duff and earn enough to get a big house. The paper blizzard slowed down to just the printouts of stories and novels to be sent out. Only the final versions would get printed. Everything else stayed where it belonged in my computer or on floppies. I could keep a house full of notes in just a stack of floppies. CDs improved that storage capacity. I no longer needed to carry around a big Sterilite tub full of floppies, just an album for CDs is enough now and my archives as of 2004 are on one CD. Just one. It's great. So the physicality of organizing notes became something a lot easier. My mobility declined but it didn't matter in terms of what to do with that file on the side character's early background. I just tossed it into my messy desktop and threw everything into the folder with the novel's title when I was done. I learned to invent file names that told me what the notes were. "Notes-Vaumuru" is general. "Notes-Vaumuru-Tribe" is a lot better for finding what I wanted to know about Blood Eater funerary practices. Keep in mind that sometimes novels get working titles like 3-Day-2007 or NewNovel or NaNo2006 if I don't have a catchy title yet. I avoided getting Microsoft Office because it cost money. That simple. I really don't like buying software. I could download OpenOffice and did several times on different computers but was a bit dubious even about that because it would run slow compared to RoughDraft. It's a free word processor written by R. Salsbury for writers -- it will do manuscript format, script format, all kinds of writer friendly things and has the one feature I love most -- the Pad file. You can download it from the site I linked it to, http://www.salsbury.f2s.com/. Either a text file or an RTF file in RoughDraft will have an attached Pad text file. Chapter1.txt will also have Chapter1Pad.txt -- and so I can put the Cast List in an attached text file with that chapter of that novel and keep it in its folder. That became the repository for all notes about my novels. Cast list first at the top of the Pad File, copied and pasted over into the next chapter's Pad file. Then under that, a couple of empty spaces and NOTES about setting, this and that, plot speculations, anything else relevant. All in one place, all in one file. The synopsis, when I'm being sensible enough to put in a chapter by chapter synopsis while writing the chapters, goes in the Pad file. This is a great organizational tool in itself. They're not separate bits of paper and I know where to look for them. Updating proceeds as I add to the novel and I can find the notes a lot faster than wondering what VaumuruNotes8-3.txt is about and which one had that bit about what Blood Eaters use for condiments at their cannibal feasts. The more of this stuff you can keep track of outside your head, the better. Interruptions can mean the notes make little sense afterward. Did I set up the Blood Eater tribe as the mortal servants of a prehistoric vampire clan, is that how they got their name? It was in a much earlier version, you even met their ancient vampire in that iteration. Later, I decided vampires were extraneous and eliminated that in favor of tribal spirits of ancient cannibals who stole magic by eating other shamans in ritual. Cannibals with real magic are scary enough by themselves. The danger in disorganized notes is that I could be working on the last chapters, editing and tweaking, check notes, find something that was related to the now-deleted vampires like where their crypt is -- forget that was about the vampires and put it in. This is how you get scenes happening in the third floor bedroom of a two-storey house. Still, the Pad file organization method is a good one and a lot better than none. It at least attaches to the current version of the chapter, so if I remember to edit the vampires out of the Pad file, they won't turn up when I check the Pads for subsequent versions. Then I got this netbook. I'd forgotten all about MS Office. It cost money. It cost a lot of money usually. The price has been coming down but I hadn't been paying attention because I'd decided not to bother getting it. My new Acer Aspire One came with a sixty-day trial version of MS Office 2007. I'm also working on the final drafts so that I can start shipping these novels to publishers... and that is where you do need something beyond RoughDraft. Wonderful as it is for composing novels, it will not create Word .DOC files. I needed to put the final versions of my novels into .DOC format for some publishers who demand .DOC format. OpenOffice will create .DOC files. You can get it for free. So if you don't feel you need OneNote after this article, you might not need to get MS Office at all. Pure laziness was what drove me to buy a boxed set of MS Office 2007 on sale instead of just downloading the excellent freebie office suite. I might actually get both, because looking at the index page, it says it'll create PDF files. This would be great for doing e-books ... but I'll see if Word does it too or if OpenOffice only does it when you buy Adobe. As it happens, MS Word 2007 by itself was $159 at the best price I could find online. MS Office 2007 including Word, OneNote, Excel and PowerPoint was half that price at $79. So that's how I happened to get Microsoft OneNote on my computer at all. It was put in on the trial version and then when I bought the suite, the product key unlocked all of its features. MS Word has another feature novelists may seriously appreciate. Its grammar checker is a useful tool. It'll rate your prose by grade level needed to read it. This can be used as feedback to start bringing your prose down from the intellectual heights of "readers must have two years of college to begin understanding your literary novel" into "Eighth grade dropouts can read and enjoy your popular novel." The latter results in more sales and many more readers. Like using a spell check, use some judgment when the grammar checker flags a long sentence or difficult construction. If the long sentence works better, keep it. What it'll do though is flag all those times that the long sentence happened by accident or careless punctuation. It'll spot redundancies and clumsy constructions that are easy to create in freewriting. It's not bright but it's a very patient copy editor and passive enough to leave the choice of what to do to fix your prose to you. Now that I have it, I'll probably run it on all my submissions routinely just as one more proofread/copy editing pass before sending or printing them to mail. I probably wouldn't have bought it just on its description. It was only when I started poking into something that got thrown in with the word processor I wanted. I'm a disabled novelist looking to become self employed again by way of selling books. This doesn't really demand business meetings, scheduled projects, notes that can be shared with the rest of the Team, minutes of meetings and all that bureaucratic foofaraw. I'm not in a profession that requires a tie. But the age-old problem of keeping track of how many villagers there are in the Black Rock tribe, which ones are good at hunting, which ones are annoying to their neighbors and what taboos the tribe has, that's something OneNote can resolve even better than just making notes on Pad files. I'll keep RoughDraft for my rough drafts. I'll keep doing Pads. But One Note will become a way to process the ever-growing 10,000 word Pad files into something easier to search and use, if I just spend a day or two organizing what's there. Screen shot of Vaumuru's Curse notebook on MS OneNote. My screen colors are customized because I dislike black text on white, it hurts my eyes if I write too long. The notes in the Pad file on the last chapter of Vaumuru's Curse are the most complete. Names jotted in all the previous chapters at the time I coined them are highlighted by the spell check on the screen capture above. If I take the time to put all the names in the user dictionary, the process of searching and replacing all the times I wrote Kuvo for Kovu will become a lot easier... and I'll find the ones that are Kovuu and other misspellings rather than searching each misspelling separately and guessing what it is. RoughDraft has a spell check too connected with an online dictionary. It's good -- I'm not saying you can't do these things just using RoughDraft. But this file is a lot easier to navigate than the Pad files that I'm used to. All of the Cast List by chapter notes were in order and linear -- and came first before that really important note in the upper right. While I was editing a late chapter, I don't remember which one, I noticed that Guri's dad had the name of a character I knew I killed in the mammoth attack in an early chapter. I made a quick note to go back and check the name on Guri's dad. While I was doing this OneNote file, I skimmed down the names and noticed that dad's name was Julo -- a similar construction because a lot of the tribal men have that two-syllable construction, and the same initial. It was an easy, natural, intuitive mistake. So I added to that little note in OneNote by clicking onto it and adding text. You can edit, add, delete, expand any of the text modules. You can import images from online or from your computer. You can sketch and draw on the page in OneNote, or use the mouse to write if that suits you. Things like scribbling a red arrow to denote "This one is connected to that other note" is possible. Branching is possible. 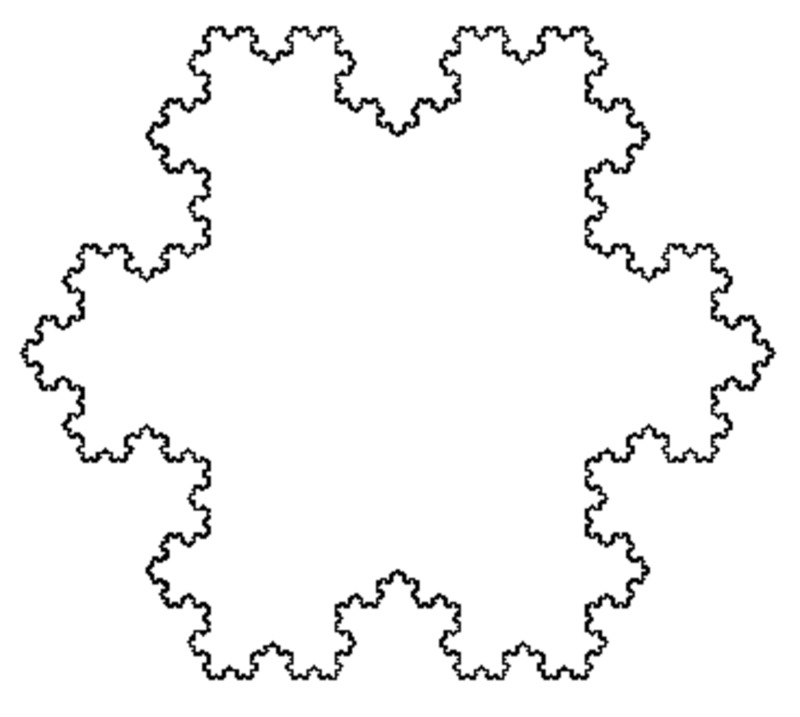 Branching is one of the best methods of idea generation around. It's a good way to get going while outlining and figure out some good plot ideas. Let's do another screen shot with a branching diagram. 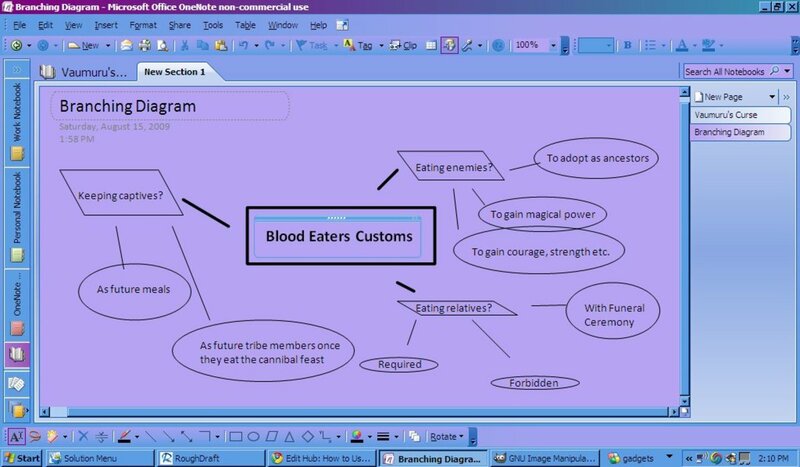 Branching diagram for Blood Eaters Customs about cannibalism, screen shot. MS OneNote is a lot more useful for things that normally get done on a legal pad on a clipboard that winds up under a stack of art supplies with a cat sleeping on top. It's much easier to reference these things too -- look at the side where every page in the novel notes is visible by its title. Branching Diagram is one that I can find easily when I have Character Bio - Vaumuru and Character Bio - Kovu and a dozenr more for major characters in the notes. My book is in its final editing stage. Any changes I make will go into this OneNote folder and I'll be able to easily check where they affect other things in the novel. I might make a page for "Changes" and check for several of them all at the same time, per chapter. The more I document my editing process, the easier it's going to be to avoid having scenes take place in third story rooms in a two story house. Or scenes involving dead men returning from chapter 2 to attend a wedding. I could search online for maps of the area around the La Brea Tar Pits and search for maps of how it looked in the Pleistocene, dropping those in on their own pages and scribbling on them with the Draw function to show characters' journeys. I could pull in quotes from articles on Smilodon fatalis and Mammuthus primigenius to make sure my descriptions of the animals are accurate and consistent with what science has already discovered. I don't need to scatter all these things over my desktop and have half a dozen windows open to hold them either -- they can often be put on the same page if they're small. I could also search inside every file for something like "Vaumuru" or "Blood Eaters" and find every note on it highlighted. This can be very useful, so can getting rid of those highlights later on if I'm looking for something else. If I decided to rename Vaumuru to make him Urgal, then I'd be looking all over for him and trying to sort that out. He used to be Thumuru. I just got done doing that in a linear fashion. It was a pain, but it's done. The best way to use MS OneNote while writing a novel is to treat it like I did the Pad files, or use the Pad file and then transfer everything in and rearrange it. Pad files are attached to the text so they really are that convenient. But the important note to check that name and fix that name was way at the bottom -- not up at the top and Tagged as an important To Do. I could easily move all those other things around to make sure the To Do's are at the very top of the main file. Or copy them into the main file from other files as I come up with other ones. Putting a thumbnail of "The Kill" by John Houly, a beautiful graphite drawing I bought from him, in the top of the main file could be inspirational and also, in a few years when I've done still more novels and am trying to remember which was what, graphically remind me "This one is the Magical Pleistocene" when I've got an alien planet with tentacled blue guys that has similar naming conventions and they cuss a lot. I'm going to set up my new Ideafile as a notebook in OneNote, by itself. I get ideas for new novels and stories all the time. Very often they are ideas I had before, forgot I had, they're coming closer to being written and I think of details about them. Keeping them all in one Notebook would let me find out fast that the news item I saw about reconstructing vanished text on old scrolls relates to the Lovecraft story "Palimpsest" that I'm still researching. Putting the URL to the article and maybe some relevant quotes will really help when I get around to doing that story -- or turning it into a novel, because it could become one. In writing this, I just got the idea that Palimpsest might not just be a one-off short story. It has the potential for a novel because I could follow the effects of the cursed GIF through a lot of different characters simultaneously. That's the type of thing that belongs in "Ideafile" files -- only they wind up so disorganized that it turns into 30,000 words of unrelated hash. Keeping each idea in its own page or folder would make sure that as these concepts develop, the ones that accumulate more information (and come closer to actually being written) are ready to pull out and turn into Notebooks in their own right when I start writing the book. My organization methods are personal. I tihnk anyone who tries OneNote will start to discover their own ways of sorting the information. Do it in the way that works best for you. I could just as easily and maybe easier have taken the irregular line to do swirls around the points on the Branching Diagram as made little formal ellipses with the ellipse tool. You can scan in physical notes and have their images available on the computer, thus allowing the big box of paper to vanish into the recycling bin. Scans of illustrations I've done for various books in progress like my character portrait of The Necromancer for The Necromancer's Tale can go right in with their notes -- and when I come to describing him in an added chapter, I can get the details of his features right. Ever since I got my first computer, I dreamed of being able to put together a novel's database -- a searchable database with every detail of the setting, characters, stuff I found online about the setting, ideas about it all in one place where it's easy to find that information and look at it in different ways. Several friends have suggested getting Wiki software and doing it in the Wiki. What stopped me from that was the sheer clerical drudgery of going through my texts as written to find all these details and input them. If I had a secretary to throw the task at, or enthusiastic fans putting together a concordance out of the printed books, then I'd love to have those at hand when doing sequels. OneNote makes it easy to do stuff like that while it's in progress, when the information is fresh and the elements come up randomly as they do. I can just add to it as needed including graphic information and reorganize so easily it's better than shuffling the paper. Being able to move something like an entire block and then add to that block is a lot easier than redoing it completely or retyping it at the front end of a text file. So if you are considering getting MS Office in order to have Word for its grammar checker, its file format or any other feature, think about getting the MS Office 2007 Suite instead. It'll save you about half the price and you get this great tool for organizing your notes on anything thrown in for better than free -- for reducing the price by half! I feel like they paid me to try it because of that price difference. Now that I've got it, I know it'll become something I use every day. The Work notebook that comes in pre-programmed for appointments and meetings and so on may become useful for the last stage writers face -- sending out submissions and tracking when you sent them. It's one thing to have a novel out on submission to several publishers by query, or send full manuscript to one. Quite another when I've sent out several novels and don't remember whether I queried this publisher about that other one yet. Keeping track of it right from the get-go will help me understand what each publisher likes or not and whether I missed a great opportunity by forgetting to query to a publisher that loves that genre. For finding publishers, I recommend Writer's Market Online.- http://www.writersmarket.com/ is an inexpensive service that is constantly updated. It's the same company that's done the annual Writer's Market books for 90 years. The online version gets more updates and doesn't start taking up a bookshelf with buying the new volume every year, which got to be a bit cumbersome a few years ago. They're good for topical nonfiction markets too, especially high paying topical nonfiction markets that could turn you into a middle class prosperous homeowning author instead of a $5,000 a year SFF purist. A lot of the research needed to write good novels is also useful research for article writing. This is where OneNote entries can become a good searchable database for stuff to sell again as nonfiction. The cool things I read up on about Smilodon fatalis could be science articles for online and offline magazines, especially if I combine a good dozen sources and write up a clear overview in plain language for that eighth grade dropout who still likes reading for fun. I'm not sure if I'll ever use PowerPoint for anything or whether I'll put in the time to learn how to use spreadsheets. I may wind up just getting an accounting service when my finances become positive and I need to start tracking them, that's my math block talking. I could also decide to spend a week gritting my teeth and doing tutorials till I can do it myself if it gets too complicated because that would spare more money for art supplies and reference books on dinosaurs and sabertooths. It depends on how life goes. I think the bargain of getting MS Office 2007 for half the price of MS Word 2007 was a lucky break though, and hope this article convinces you to take a look at it if you already did and have OneNote on your computer. If not, consider whether you may want it to keep track of the ten thousand details in any novel that need continuity checks. However you organize your notes in OneNote, you'll be glad you did when you get back to it after a hiatus and forgot everything about the book in favor of remembering to pack for a vacation. Thank you so much for this hub robertsloan2. I was trying to use MSOneNote to plan a novel; but didn't understand how to use it productively. I guess I'll have to check it out again. how did you customize your screen so white parts do not hurt your eyes? i need this for my computer too. Thank you so much for your review and tips. I am a college junior working for a degree in research writing. 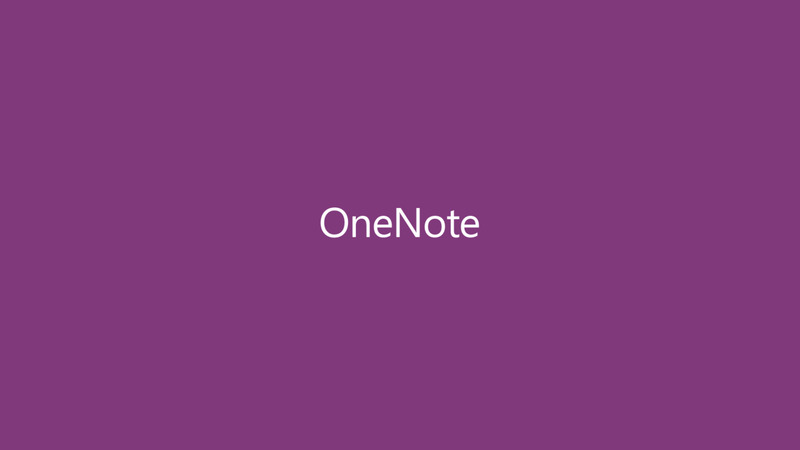 Your comments about writing using MS Onenote were functionally useful and helped me decide to to buy the product. I can definitely use it and your guidelines. I'm almost ashame to say that I've had OneNote for the longest time and didn't even know what it was. Then last night I was in pain, and pissed off out of my mind because I couldn't remember the color of the furniture of one of my character's house. I was going through all my notes to see if I could find the one line about the furniture. You would think that Word would be helpful, then you realize that the furniture line was so insignificant that you don't know how to search for it. Sigh. Anyway, I spent a few hours reading about better ways to organize my stuff and hooray! OneNote seems to be the thing. I agree that OneNote is the best note taking program. I use it all the time in school and for organizing my files for the program I am working on. It really is the best tool to have. I'm rewriting my novel and still making notes; I'm going to look into MS One Note. Thanks. Thank you! It's great. I'm really enjoying it. Finally something that can work to organize novel notes better than an actual database type thing. Some writers use spreadsheets but I had trouble organizing notes that way since I write long notes. Same trouble as Twitter really. OneNote solves that so perfectly. I just recently discovered MS One Note when I got my new laptop. I LOVE it, but haven't done nearly as much with it as you have. Thanks for sharing your experiences with it.